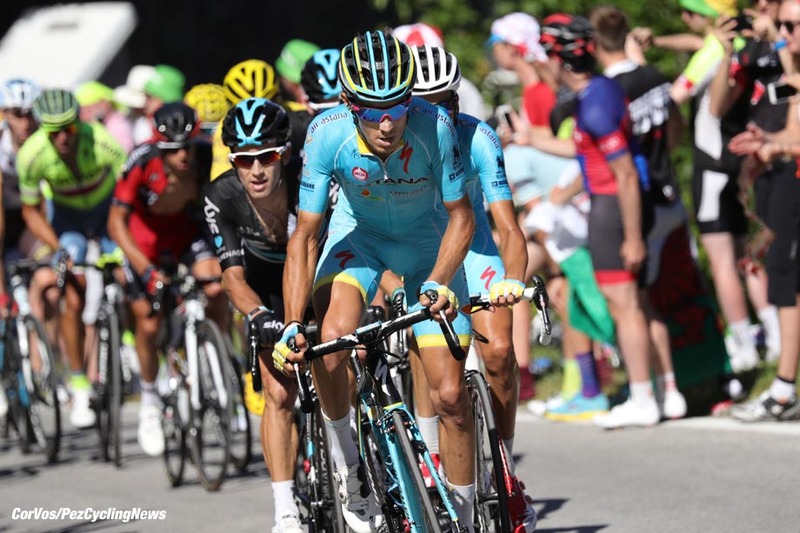 PezCycling News - What's Cool In Road Cycling : TDF’16 St.17: Za Za Zakarin! TDF’16 St.17: Za Za Zakarin! As has become the standard for this Tour it was a fast start to the stage, 51km were covered in the first hour. Eventually a break formed who would fight it out amongst themselves for stage glory. Tony Gallopin and Alexy Lutsenko were the first to ignite the attacks but they were clawed back on the Forclaz and Rafa Majka and Jarlinson Pantano reformed their alliance from Sunday to go clear on the descent. 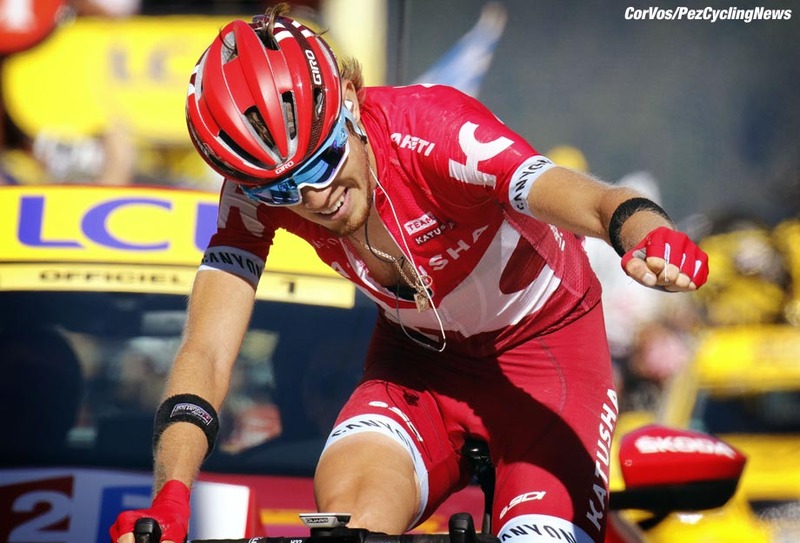 They kept their advantage onto the final climb but were caught, and then dropped, by a storming Zakarin who soloed the majority of the Finnhaut-Emmoson to record a first victory for Katusha in the Tour this year. The GC battle was non-existent for virtually the entire stage but inside the final kilometer a Richie Porte attack sparked a response from Froome and the former team mates forged clear to put time into everyone else. Yates put in a great ride to distance Nairo Quintana who has had a very disappointing Tour so far. Bauke Mollema retains his spot on the podium but he also lost time on the horrifically difficult finale. After a stage finish and a rest day in Switzerland, the peloton headed back west but remaining in the land of chocolate and cuckoo clocks for this mountain stage. The first 150km were rolled towards the main difficulties of the day. 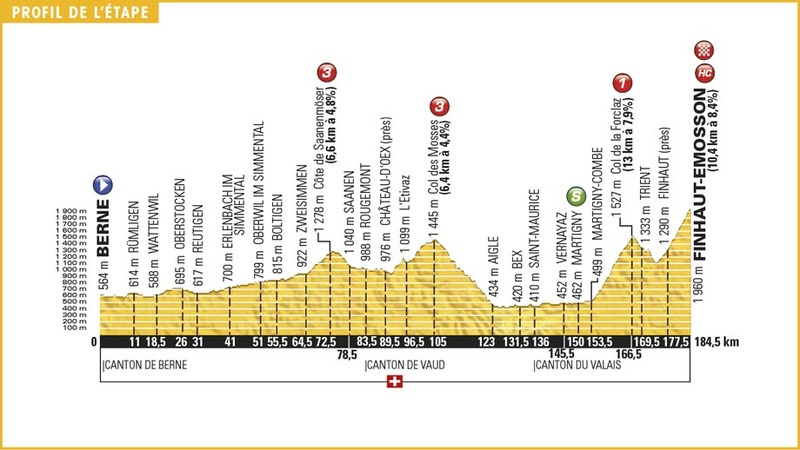 Before that though there's some smaller hurdles in the form of the third category Cote de Sannemoser (6.6km @ 4.8%) and Col des Mosses (6.4km @ 4.4%), also a third category climb. This was just a warm up for the hideous final 31km where the riders faced the first category Col de la Forclaz (13km @ 7.9%) and a hilltop finish in the hors-category Finnhaut-Emosson (10.4km @ 8.4%). 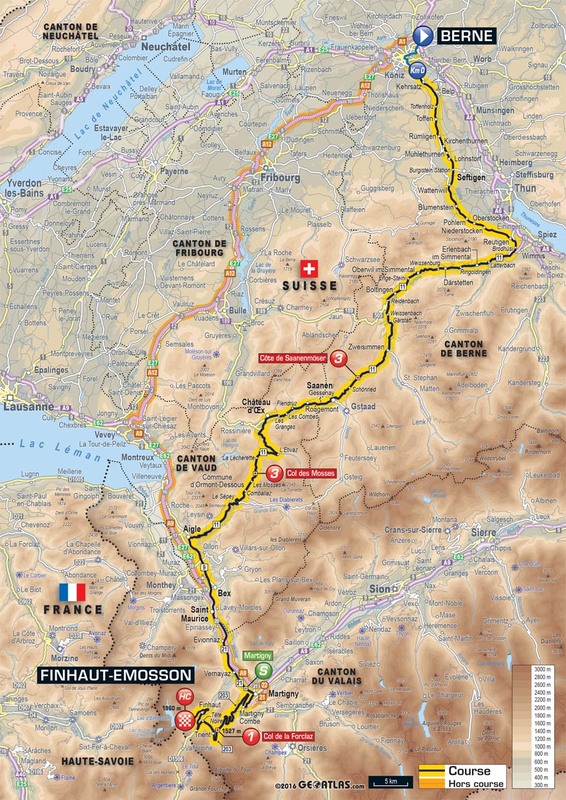 If the finish was a few kilometers further up above the Emosson reservoir they would be in France but they don't need their passports until tomorrow. The previous stages have all started quick but it was a dramatic crash which kick started this stage - Gorka Izagirre (Movistar) went down hard and broke his collarbone thus ending his Tour. It was also further bad news for Quintana (Movistar) who had now lost a team mate who would've come in handy on the flatter parts of the route today. The first hour covered 51km and it was a brutal start for an already exhausted field. Eventually a break did go consisting of; Tanel Kangert (Astana), Stef Clement and Jarlinson Pantano (IAM Cycling), Kristjian Durasek (Lampre-Merida), Rafa Majka and Peter Sagan (Tinkoff), Domenico Pozzovivo (AG2R-La Mondiale), Tony Gallopin (Lotto Soudal), Steve Morabito (FDJ), Ilnur Zakarin (Katusha) and Brice Feillu (Fortuneo-Vital Concept). They were pursued by an eight rider strong group with; Alexey Lutsenko (Astana), Greg Van Avermaet (BMC), Serge Pauwels (Dimension Data), Alberto Losada (Katusha), Rui Costa (Lampre-Merida), Thomas Voeckler (Direct Energie), Julian Alaphilippe (Etixx - Quick-Step) and Ruben Plaza (Orica-BikeExchange). Neither group were content to sit up and wait and the extreme pace caused a splinter effect on the second climb of the day as Lutsenko, Van Avermaet and Voeckler were the only three left in the chase group and they forged on in pursuit of the leaders. After a very hard chase and a descent off the second climb where caution was well and truly thrown to the wind, the chasing trio finally made contact with the leaders with just 67km left of this exceptionally fast stage. The lead group consisted of some riders who could leave the Tour as a success; Pantano, Van Avermaet and Alaphilippe and some who had all the pressures on their shoulders after their teams had had a disappointing first two weeks; Kangert, Pozzovivo and Zakarin. The stage was absolutely flying by and with just 30km left to ride the consolidated break had a 13 minute lead as they hit the very consistent gradients of the Forclaz. The early turns of the stunning vineyard lined Forclaz immediately kicked some riders out of the break as Tony Gallopin and Lutsenko pushed clear. Peter Sagan had done a huge amount of work to bring Majka up to the leading group but he was distanced alongside Pauwels as the road continued to climb above Martigny. With the chasers within view Gallopin eased up to wait for the Clement led group but Lutsenko was content to push on as the vines fell away and left wood-lined roads. Gallopin had forgotten to hitch his wagon to the back of the Clement train and he was the next to fall victim to the pace. Lutsenko continued his push on to the top alone. Meanwhile, in the peloton Movistar were finally doing some riding and trying to soften up Froome's train. The remaining climbing domestiques for the yellow jersey weren't moving and more work was required to isolate the dominant race leader. After a brave effort Lutsenko was caught and then immediately dropped by the lead group. There were now just nine readers left with a shot at stage glory. In the main group the pace making of Movistar had back fired and Quintana was now watching his team mates fall back through the peloton and off down the hill without doing any damage to the Sky train. Astana were the next team to step into the breach but they were also failing to chisel off any of Froome's support. The break crested the summit of the Forclaz, with Majka taking maximum points, with a ten minute advantage. The smooth, wide descent was perfect for daredevil riding and Pantano and Majka were the first to sit on the top tube and open up a gap as they flew down the wonderful Swiss roads. Nibali's pace making finally paid off as Geraint Thomas (Sky) was kicked out of the group but Froome was still staring at the backsides of three colleagues as they edged towards the top of the first part of the hideous finish. The only drama was for Tejay Van Garderen (BMC) who couldn't stand the pace and was dropped, to cap off a disappointing Tour for the American. 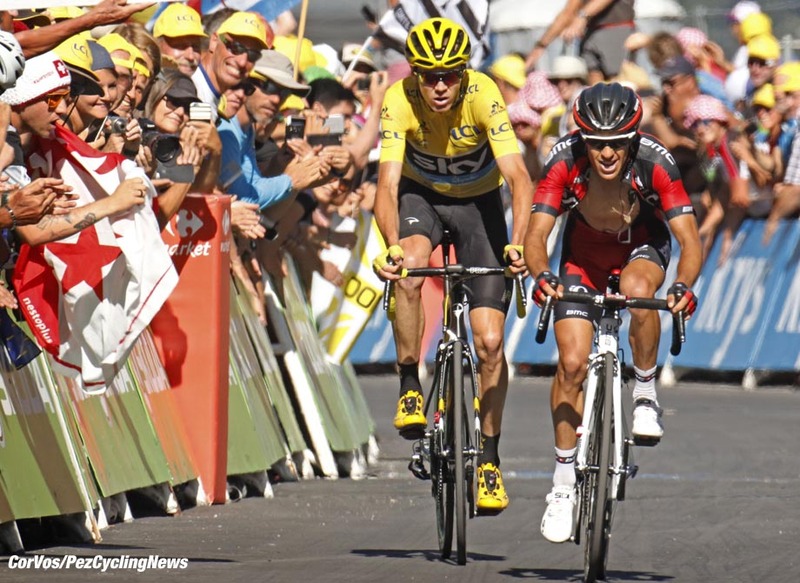 Onto to final climb for the break it was a case of deja vu all over again as Majka and Pantano were once again riding together at the front of the Tour de France. Zakarin was the first to react to their attack but he was immediately chased by Brice Feillu, chasing France's first stage win this year. Zakarin was the only one of the duo to make it to Majka and the trio were now pushing on, away from their weaker breakaway mates. Zakarin was the first to kick on with 6km left to ride but Pantano was press ganged into chasing him and latched back onto the Russian's rear wheel. For the moment, Majka was the loser as he was left to watch the leaders disappear up the road. Zakarin kicked on again and Pantano was left peering into his gears, looking for some more power. It was looking like game over for the Colombian stage winner. Astana had continued their pace-making on the final climb and despite the exceptional speed the baby blue clad team were tapping out, Froome still had three team mates. As yet, there was no movement from Quintana who was sat slap bang in the middle of the group, letting Astana do the work that his team had started. Nibali gave way to Diego Rosa (Astana) and he continued ramping up the pace but it was much like previous stages, but instead of a Sky train it was an Astana train with no attacks coming from behind. Rosa gave way but there was no attack from Aru and he gave way to Sky. Alejandro Valverde (Movistar) was the next to pick up the tempo and he dropped Sergio Henao (Sky) and briefly appeared to put Froome in some difficulty. Dan Martin (Etixx - Quick-Step) finally broke up the monotony as he attacked but there was no response from the behind. Valverde and Sebastian Reichenbach (FDJ) were distanced as they hit the 4km to go barrier. The Martin attack had weakened the group but it hadn't really had any effect on the main favorites. In the lead and Zakarin was flying under the flamme rouge towards his first Tour de France stage victory. Pantano was pursuing but the Russian continued to eke out a gap as the climb really kicked up. The final 300m were the hardest and Zakarin was also concerned with zipping up his jersey for the sponsors which almost caused him an embarrassing crash. It was arguably the most exciting part of the climb as he finally zipped his jersey up a little bit and crossed the line an exhausted wreck. Pantano crossed just under a minute behind to mark a great time in the Northern Alps for the Colombian. Rafa Majka was the next to cross, safe in his polka dot jersey. Finally, some action as Richie Porte (BMC) hit out and immediately gained a gap. After some work from Wout Poels (Sky), Froome finally showed his hand, he was immediately closed down by Quintana - who was happy to take up his place on Froome's wheel. Froome went again and latched onto his former team mates wheel who was happy to pace the yellow jersey away from the chasing group of Aru and Quintana. Adam Yates (Orica-BikeExchange) kicked on from the Quintana group and he immediately distanced the Colombian who was clearly not at his best. Yates kept up the pace and he split apart the GC group with Aru and Meintjes (Lampre-Merida) unable to keep up in the final straight. Martin trailed Quintana after he attempted to at least breath some life into the GC battle but the big loser of the day was Bauke Mollema (Trek-Segafredo) who was the first of the big favorites to go backwards when the attacks eventually happened. The day belonged to Ilnur Zakarin however who missed Majka and Pantano's initial attack but was able to continue to up the pace and take a brave win at the Emosson reservoir. For the GC riders it was a case of either not having the legs or being contend with their top 10 position. Once again, it's copy and paste for Sky and Froome continue their dominance. Stay tuned to PEZ for Ed's day 'Roadside' in Switzerland. 25. Alejandro Valverde (Spa) Movistar at 10:01. 25. Tanel Kangert (Est) Astana at 39:24.